This article was originally published on bdnews24.com on 21 January 2012. Co-wrote with Hira Siddiqui. In the latest development in a series of political upheavals, the so-called democratic government of Pakistan has opted for a head-on collision with its strong military leadership. The ties between the two power houses began with the Memogate scandal in which the former Pakistani Ambassador to the US Hussain Haqqani reportedly sent a memo to the White House on behalf of President Zardari to request the US to keep the Pakistani army at bay. As the Supreme Court of Pakistan dealt with the Memogate case and demanded responses from both civilian and military leaders, a clash of opinions surfaced. The prime minister accused the military of submitting responses to the Supreme Court against its approval. As a result, the military has responded of harsh consequences to the extent that the country finds itself on the brink of yet another military coup. However, the tension might recede given the generals already held meetings with the prime minister and the president of Pakistan. Trailing back from this recent development to the countless previous ones, it only confirms that Pakistan is a drama that never stops short of entertaining the world media. The storyline usually evolves around nationalistic pride with an ever complicated relationship with a big brother. The story also includes a romantic sense of having an enemy neighbour and a backyard turf in Afghanistan for a spectacle of espionage mastery. Once in a while, the show gets its cyclical climax with a few general’s showdown in the name of saving the sacred country. It is a tale never to end with a happy ending, at least as it appears from the last 60 years. The only problem is that it’s a drama in reality, its victims are real lives and the loss is a whole country’s unrealised potentials. It is a drama where the big shots have been skilfully deceiving its people, who are supposed to be the main actors instead. Anecdotes and analogies aside, a careful look at Pakistan’s external and domestic actors can reveal that everyone is playing along with a vested interest in mind that has nothing to do with Pakistan’s own good. Firstly, there is its ‘complicated relationship’ with the US. Despite all the short honeymoons, Pakistan very well understands that the US has always been taking advantage of their mutual relationship to its own end. From the cold war period to the current Afghan war, the relationship only gets rosy when Pakistan defers to their strategic interests. Then there is Pakistan’s domestic politics, which is nothing more than an unsavoury tale of moral bankruptcy. It does not matter whether it is Pakistan Peoples Party (PPP) or Pakistan Muslim League-N (PML-N), Pakistan has been forced to marry the choice between these two, who are equally corrupt, incompetent and weak with a facade of democracy. 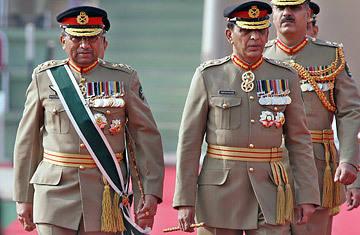 For a ruling party, it is more important to keep the generals happy than making sure the people were satisfied. After all, in Pakistan, an unhappy military changes the government, not an unhappy population. When the carrot doesn’t work well, the governments are deft at using the US as a stick in the name of democracy. Perhaps, the Memogate scandal sounds relevant here. The US themselves are more than happy to sponsor either party depending whichever works best in their interest. No wonder that Pakistan became a ‘front-line ally’ against the communists under General Zia-ul-Haq and a ‘strong ally’ against the War on Terror under General Musharraf and during Zardari’s period. However, isn’t it normal for a country to be rational to engage in foreign affairs for its own strategic gain? It also appears conventional for political parties to do whatever in their means to remain in power. After all, unstable, illiberal democracies are not rare among developing countries. So why is Pakistan’s an attractive story? Part of it because, Pakistan is situated in a conflict prone region. But it is mostly because the military generals in Pakistan hold all the aces, and they play it very well either by deploying their toys on the streets of Islamabad or rather being discreet in their drawing room politics. Accustomed to being coaxed by the US and the ruling political parties, they have become fashionably obdurate with an egotistic sense of patriotism. Also, their right arm, the ISI and its clandestine murky activities appeared as an overshoot of its own credo, ‘faith, unity and discipline.’ Together they have become an added burden in Pakistan’s own good. However, Pakistan military’s popularity has been at its lowest ebb since the discovery of Osama Bin Laden in Abbottabad and the death of journalist Saleem Shahzad. Nonetheless, the country’s fate is unequivocally tied with the generals’ discreet approval. It has never been so conspicuous until recently with the US’ struggle with the Talibans. It is little wonder that Admiral Mike Mullen spent so much time with General Kayani the past four years. However, relentless events from Operation Neptune Spear in Abbottabad to the ISI’s double play between the ‘good Taliban’ and the ‘bad Taliban,’ a sense of suspicion, anger and betrayal overshadowed the US-Pakistan strategic allegiance. The complicated relationship has reached its tipping point with NATO’s air strike recently on Pakistan military. At this critical juncture, what awaits depends on who plays what and how for Pakistan. The US is desperate for a stopgap in Afghanistan before their troops’ withdrawal in 2014. The Talibans are waiting with a clock ticking towards an opportunity for their resurgence. The various factions in Afghanistan are already making calculations and eyeing for a future through their warlord lens. Furthermore, the US is more concerned about Pakistan strategically, since its nukes are a matter of its headache. As such, who curves the fait accompli for Pakistan? In an ideal world, it should be the people of Pakistan. Unfortunately, the shackles of sham democracy make this simpler said than done. The people have tested the Pakistan Peoples Party and the Pakistan Muslim League who, despite a different façade each time, have yet to prove their worth. Both parties have been in office more than once but have little to boast of. Right now, the tempting option is to take a bold step, choose a person who promises change and clearly enjoys massive support. But is Imran Khan the step in the right direction? Khan’s success story in Pakistani politics is nothing short of a fairytale. He did not only manage to gather an impressive crowd in Lahore, but the rally in Karachi proved that the man is different from the rest. He infiltrated into a territory that few have treaded before. Dismissing all sceptics that Karachi will let itself be controlled by no one but the Muttahida Qaumi Movement, the city rose in all its glory. The euphoria will, however, not last for long. Khan may take a bold stance against the US and publicly declare his assets, but when it comes to the military, he knows the generals must be kept pleased. The fingers are already pointing at him for kindling relations with the military, but he knows that if he stands any chance of success, he will need that discreet nod from the men in khakis. Despite the impending tsunami, it appears that Khan is unlikely to form a majority government on his own in the 2013 elections and may perhaps settle for a coalition. Politics, it seems, will only get murkier in the coming years. Pakistan is in a delusional state where the military’s dominant position is denied and it is referred under the nickname of ‘security establishment’. Precisely because, the manufactured consent of India being an arch enemy sells very well. In such a state, the forthcoming elections give little hope for change. Even if it happens, the revolution will not be a clear one. Khan may manage to wake up the people to fight for the country, but it is going to be a long time before the military lets go.